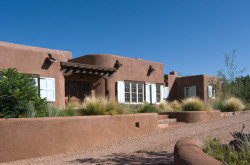 Las Campanas - Curtis & Windham Inc. In designing a desert residence and guest house near Santa Fe, we strove for a contemporary interpretation of the pueblo idiom that preserved the character of these ancient spaces and their relationship to the outdoors. We realized that once freed from the confining geometric logic of a pitched roof, we could affect fluidity in the way one room leads to another and in transitions to outdoor living areas. Our aim was to make the austere beauty of the desert visible and accessible from everywhere, while blending the buildings with the gardens and the greater desert landscape. Interior design also by Curtis & Windham.